You are here: Home / Dogs / My Cancer Is Back. And I Have The Scars To Prove It. Last Thursday our beloved Darla had another extensive round of surgery to remove multiple mast cell tumors, as well as her spleen. I took the photo on Friday evening, after bringing her home from Burlington, where our surgeon, Dr. Kurt Schulz of Peak Veterinary Referral Center, had operated on her. Two weeks?ago, while I was loving up Darla as she lay on her bed, my hand brushed across a small, flat raised surface on her side. I had felt this growth before — she’s had it for over a year — and we’ve had it tested three times because I was always suspicious that it was a mast cell tumor. The tests always came back negative. Yet it felt different now … I thought I could feel some “roots” in it. I called Peak and scheduled another appointment with the oncologist there, Dr. Kendra Knapik. Sure enough, this time it had developed into a mast cell tumor. Then — and this was odd — while I was at Peak that day, I was out in the lobby, petting a nervous Darla while talking to our internal medicine specialist, when my hand brushed against another small growth, this one in her armpit on the other side of her body. I couldn’t believe it. Kendra did a needle aspirate of that one, too, and found mast cells. Kendra recommended an?abdominal ultrasound of Darla’s organs and an ultrasound-guided needle aspirate of spleen and liver. The radiologist did this procedure while Darla was sedated. 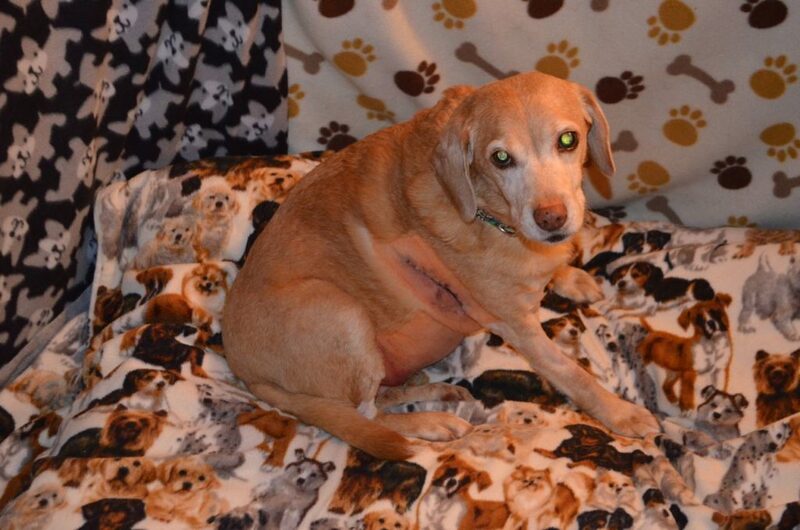 Kendra wanted to find out if her spleen and liver were cancerous, because if they were, there was no point in subjecting Darla to surgery for the skin growths because she’d only have a few months to live. We waited for a couple of?nerve-wracking days for the pathologist’s report on the spleen and liver samples to come back. Finally, Kendra called with the news: Darla’s liver appeared?clean, but the pathologist was concerned by what she saw in Darla’s spleen. It wasn’t exactly “clean,” but nor could she say for certain that Darla?had full-blown cancer of the spleen, either. Kendra called the pathologist to discuss the findings in more detail, and’subsequently (last Monday) the pathologist asked her colleagues in the lab to also review Darla’s spleen sample to see if they concurred. They did. What they saw were some mast cells in her spleen, but not in sufficient quantities or in the kinds of “clumps” that’typically signal a tumor is present. Whatever was going on in there was very early. But they couldn’t be?definitive. In calling me with an update on the pathologists’ collective review, Kendra told me about an expression they learn in vet school: “A good spleen out is better than a bad spleen in.” In other words, if there’s any doubt about a spleen, the dog is better off without it. It’s better to err on the side of caution — taking out a spleen that might be okay — than to leave a suspect spleen in the animal because of its ability to spread disease rapidly. If you’ve ever had a dog who’s had a splenectomy (we’ve done?many spleen removals over the years), they generally do just fine without them. However, the only absolutely certain way to find out what’s going on in a spleen is a complete?biopsy, and that usually means taking the spleen out anyway. Everyone involved in Darla’s case — the pathologist, internal medicine specialist, oncologist and surgeon — agreed that given Darla’s history and what we knew, based on the results we had, taking out her spleen was the prudent?course of action. On Thursday, I drove Darla over to Burlington, and that afternoon Kurt took her into surgery. This was Darla’s third mast cell operation, in fact. Because of the multiple sites involved — one mast cell tumor on each side, another suspicious area in her mammary tissue that Kendra wanted removed as a precaution, and then her spleen — the operation’took a couple of hours to complete. I stayed in Burlington that night at a hotel across the street from the clinic so I could see Darla?after she recovered from the surgery, and to be nearby in case anything happened overnight. Now, a few days later, Darla is definitely … if slowly … on the mend. She has excellent pain meds to help, and she has a good appetite. Her biggest problem is that she has no comfortable’side to lie down?on — she?has?incision sites and sutures everywhere except her back, and rolling over is out of the question. Kurt sent in a biopsy from the spleen as well as a sample from Darla’s?liver since he had her opened up. We are now waiting anxiously for those results. The ultrasound-guided aspirates can give us a good indication of what’s going on, but truly definitive results come from actual tissue samples taken from different parts?of those organs. We could still be knocked for a loop. So please keep your fingers crossed for our beautiful girl. She’s been through a lot. We hope this is it. Poor Darla, she’s been through so much. At least now you will know what’s going on and be able to treat her accordingly. I feel so bad that her surgery left her with no comfortable position to sleep. But I’m sure she will heal quickly and be back to her old charming self really soon. I’m saying a prayer for her complete recovery. Praying for sweet Darla! And of course you guys too. Awwww, sweet Darla. Bless her heart!!! Keeping good thoughts for her that all heals well & no more stuff happens!! Best wishes for a speedy recovery Darla! Praying for sweet Darla, and for her humans, as well. Hang in there, Darla, you can beat this! Oh, how nerve-wracking! It’s a good thing you became suspicious about the growth you knew was there, and then happened to find the new one. Hopefully the remaining tests will come back negative. Poor Darla! Sounds very uncomfortable. Oh poor Darla! I am so sad to hear this news. I know everyone reading this blog will have her and you in their thoughts and prayers.Sometimes life is so unfair. Precious Darla. It’s so awesome how you take care of these babies. Staying close overnight, and just all the love and protection that you give them. My prayers are with all of you. Speedy recovery to sweet Darla! I am wishing all the best for sweet Darla. Shoot. That sweet girl looks like she’s not real comfy. Hopefully the meds will allow her to get some rest – and you all too. Sending good thoughts your way. How unfair for Darla! She tries so hard. She has had so much to overcome. You and Alayne work so hard for her–as you do for all your dogs. At least they have people who truly care for them and get them the best care possible. I wish I had a magic wand to wave over Darla to bring her back up to full health–quickly. Darla does look uncomfortable with her limited ways to lie. All of you will be in my thoughts. Thinking of you all… with extra special hugs to Darla. So scary. And she’s such a trooper! But she’s got the BEST-est team to love and care for her, and her “virtual team” who loves her from afar, too. Speedy recovery Darla! You are such a sweet girl. I have the perfect solution……. buy her a feather bed! She just needs a cloud of feathers to lie on. Poor baby. But at least it will be mending soon, and this misery will fade. So, Darla……I’m sending you healing energy. Poor, poor Darla! She looks so uncomfortable! I wish I could reach through the interwebz and give her some gentle snuggles and kisses. But I am sure you and Alayne are already doing plenty of that for her. Here’s hoping for good news from the pathology report – please do keep us posted! Sending clean cells vibes via the Cosmos. Give her a kiss from us out here! Sending hugs to you all! she will feel better soon, sleep well soon, and the recent biopsy comes up clean.